Then I found out how truly toxic those pesticides are. Did you know that before World War II there were no pesticides? What we now know as “pesticides” were toxins developed for chemical warfare. Once the war was over, what to do with all that wonderful killing technology? Well, it kills bugs, so let’s use it! Well, it kills you, too. It’s just that those small doses makes it a slow death. Before the advent of the modern day pesticide, SOAP was the bug killer of choice. Why? Because soap destroys the exo-skeleton (outside) of a bug. He can’t survive. But it doesn’t hurt you or the environment. Nobody complains of a soap run-off ? So, if you have ants in your kitchen, are you going to use some toxic bug killer around the place where you prepare food? Where your children eat and play? I think not. What if I told you I had the world’s most fabulous soap that not only will get rid of your bug problem, but will keep your kitchen sparkling and germ free? No perfumes. No chemicals. No toxins. But, I digress. Bugs. Basically cleaning with this stuff will keep most of your bug problem at bay. But, say, you have an Ant Army in the spring. It’s been known to happen. Just spray this fabulous soap around any cracks where they might be entering the house. Believe me, they will stay away. See a bug? You can spray right on it. Put some of this fabulous liquid soap in a foamer, put a little foam on your fingers and you can get flying fruit flies or moths easily. So, what is this fabulous soap? Well, I have tried a lot of well-meaning environmentally conscious cleaning products and I’m here to tell you that I have found the BEST DARN SOAP on the planet. Bar none. Safe, non-toxic and CLEANS LIKE THE DICKENS. There are a lot of reasons why and if you look around on this site, you can read all about them. The easiest way to put it is to say that it’s made from all natural ingredients using a technology that makes it just the most effective cleaner I’ve ever used. AND IT KILLS BUGS. Safely. Effectively. This fabulous soap is called KD Gold and it comes either ready to use or in concentrate form. You can mix it yourself and not pay to ship the water or you can get it pre-mixed and try it out. 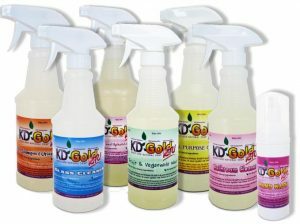 One of the most convenient and cost effective ways to try KD Gold is with our Starter Pack: Six ready-to-use spray bottles full of the most popular mixtures for KD Gold for only $30. Just buying the spray bottles would cost you about $15.00. You can also buy a 32 oz. bottle of concentrate for about $30.00. You might even want to get both so you can refill the spray bottles. Each bottle of concentrate makes 3-5 bottles of full-strength soap. What a deal! Order some KD Gold today! Using a 50 to 1 solution (one part KD Gold to 50 parts water – can you imagine how much money you can save??!! 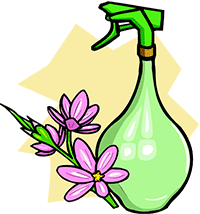 ), spray directly on houseplants with misting spray bottle; wipe leaves gently with soft cloth. For outdoor plants and flowers, including roses, put 8 oz. of Concentrate in a 2-gallon garden sprayer and fill the rest with water. Use monthly to promote plant health by improving hydration. Many users report great results fighting aphids on roses with the bonus of beneficial growth. KD Gold is being used by major agricultural firms to increase production, hydration and to guard against insect infestation. Use it in your garden to achieve the same results!